Our friends were visiting from Melbourne, en route Bali. We just had to take them for some local food whilst they were in town. Yap Hup Kee – the famous Yong Tau Foo shop in Pudu. “What the hell is that black thing.. can you eat that?” says Ger & N.
After some clarification, Ger decides to take the plunge and heaps the ‘black stuff’ onto his plate. As it turns out, the black stuff is deep fried intestine, and both our visitors polished the plate clean, declaring it was delicious. Also the chee cheong fun with dried shrimp in sweet sauce was a hit. Being originally from Japan, N declared that the texture of the noodles was good and up to expectation! Phew..
What we like best about Hup Kee is the variety of Yong Tau Foo they have – I mean, these people will stuff anything they can get their hands on, from ladies fingers to four angle beans and long beans. How on earth do u stuff a long bean right? Well, these people do it really well – fold it into a star and stuff the middle. 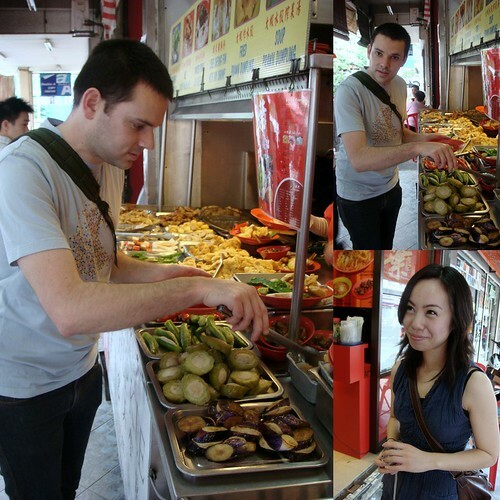 And if green veges are too healthy for you, then go for the deep-fried black intestine. Next stop.. in search of KL’s best bakuteh and the best martini! Since we are on the subject, where in KL is the best BAKUTEH served, and where do you go for the best MARTINI? ah, not many ang moh eat organs, your friend really know what's good. bring me baybeh bring me…. i love friend intestine. 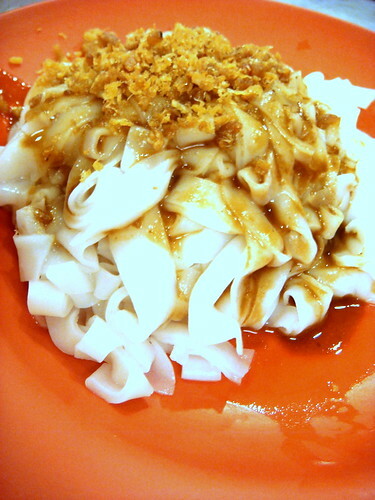 chee cheong fun is da best! Well, I know that Restoren Teo Chew Bak Kut Teh in SS2 (down the road from that Lorong 100 Tahun place) is in no way the best BKT in town, but it's convenient and there's a nice range of other stuff they can sample (assam fish, otak-otak, that sour spicy vege ("shuein choi"? ), stewed vinegar-y pork ("chu kiok shuein"? ), etc). Oh, and the salted vegetable dish there rocks! 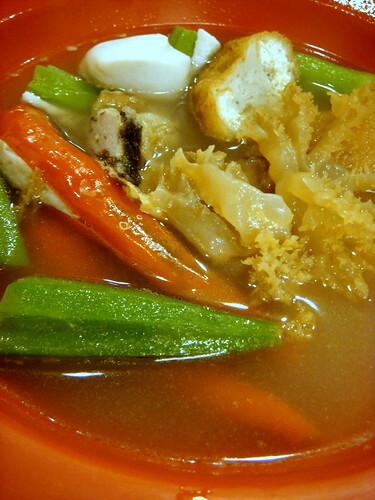 Yap Keat in Subang not bad, but originated from Klang it seems …. hmm, the one in Gunung Rapat in Ipoh can stuff even more erm … stuff!! I love your food blog! Pictures are awesome and I think I can lick the food off the screen now! Hats off to your visitors for braving the intestines! The YTF makers are very special breed of folks indeed – I mean, what compels them to stuff just about every vegetable known to mankind with the same fishy paste? this is the best place for BKT! Soup's simply excellent. Call me if u wanna go. I'll have my regular vegetarian pot! I luv this shop… and those fried intestines are really sinful, i tell u! The CCf is one of the best around klang valley – of cos cant beat ipoh, but it's still good, esp those dried shrimp toppings! They have a branch in Damansara Uptown. Martini NO more … used to be the ones made by Phil of 7ate9, but he cabut and with it the quality also cabut! Hello Cumi & Ciki, I eat to live, not live to eat, but the dishes here sure tormenting my taste buds like crazy! 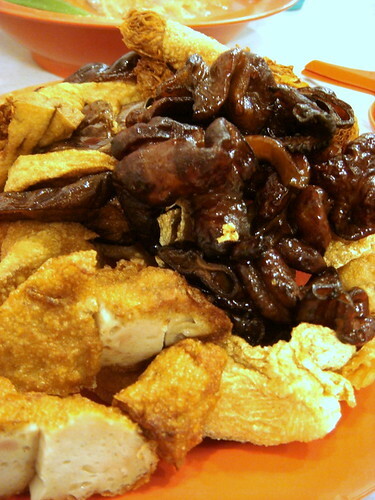 I love yong tau fu…. You have fun and have a great week, best regards, Lee. a stone throw away fr my off. Must order d DRY BKT, exotic pork tendon, stomach n some signature dishes as well. "diluted" which I've complained. They told me 2 call them first so that they can accomodate my request 4 a "thicker herbal broth." Seriously?! long bean yong …. never seen them before !